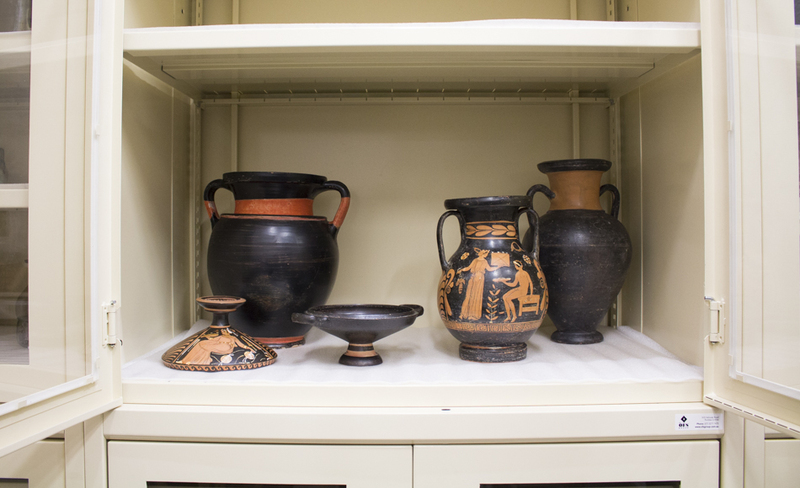 New glass fronted cabinets, incorporating a combination of soft slide drawers and open shelves, were purchased to house the antiquities collection, which is a part of the larger archaeology collection, the care of which falls under the umbrella of the Cultures and Histories Program. However, it was not as simple a job as emptying one drawer and putting the contents into another, albeit far more suitable, drawer. 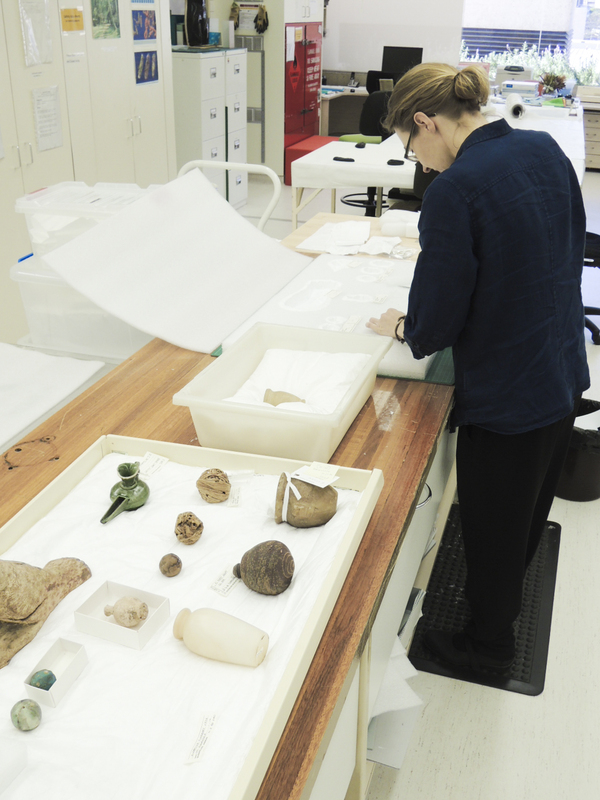 Before the first object was moved, staff from the Archaeology Department carried out a systematic audit of the collection in order to highlight any inconsistencies or anomalies. 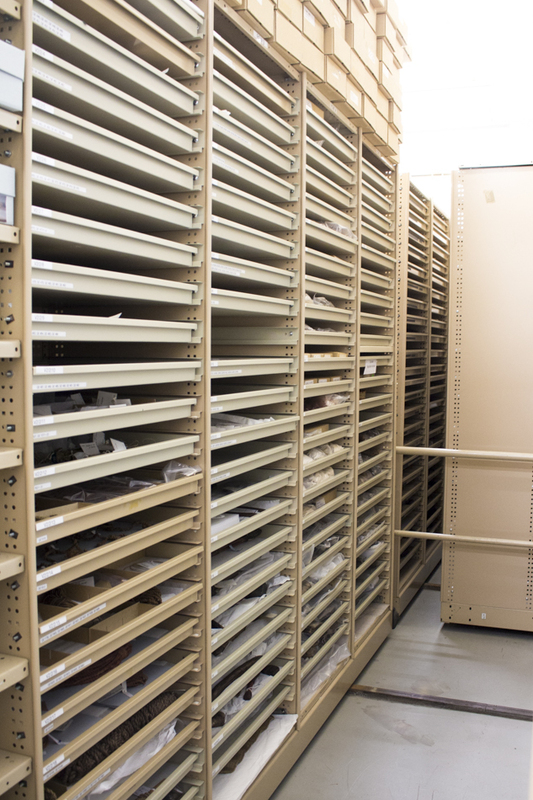 Even when the audit was completed, there was still more work to be done prior to rehousing the collection. 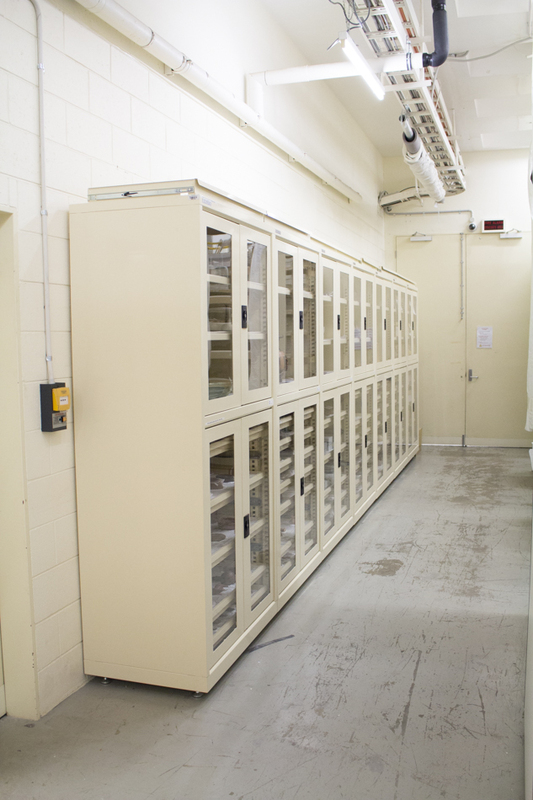 The old compactus units needed to be removed, and their contents were relocated to temporary storage at Southbank. Once this was completed the old compactus was dismantled and removed. The rehousing project offered the opportunity to re-organise the antiquities collection, into object types, or geographic location. The next task, and perhaps the most enjoyable, was for the Archaeology staff to lay out groups artefacts into a sample drawer, to get the best use of space and aesthetics. It was also necessary to make allowances for objects currently on exhibition in the ‘Discovery Centre’ (QMSB L3). Once we were happy with the “look and feel” of a new drawer, it fell to staff from Conservation to custom make cut outs or ‘nests’, into archival foam drawer liners and to fit the drawers into the new cabinets. Acting upon advice from the Conservation team, we also utilised the glass fronted open shelves to house larger pieces that were in a sound and stable condition to allow them to be stood upright; as per their intended use in ancient times. 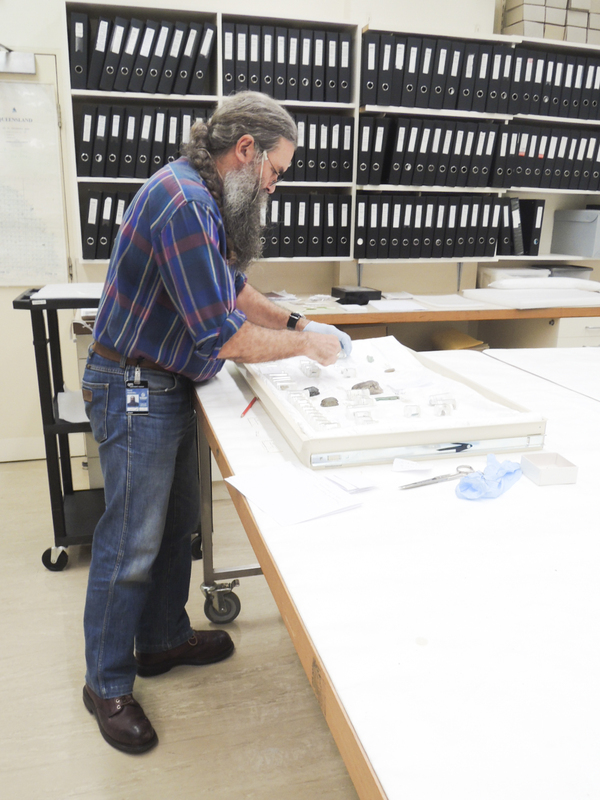 Staff from the Queensland Museum Archaeology Department worked closely with members of the Conservation Department in order to make this refurbishing project a success. 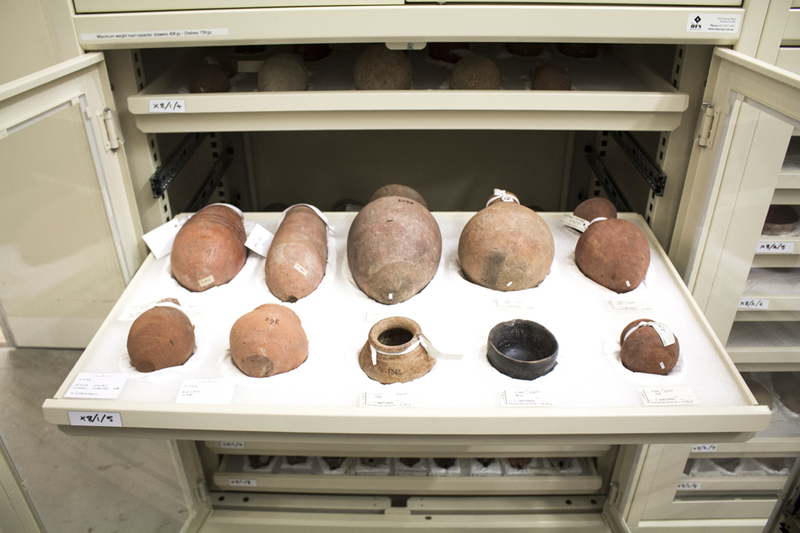 The antiquities collection is now contained in such a manner that facilitates ease of access and viewing for research purposes as well, combined with safe and secure storage. Furthermore, this enterprise has facilitated deeper object and archives research, which in turn adds to our knowledge of the collection and allows us to offer greater curatorial support to touring international blockbuster exhibitions. Previous PostRemembrance Day… Ipswich Railway Workshops MemorialNext PostWhat will our future hold?